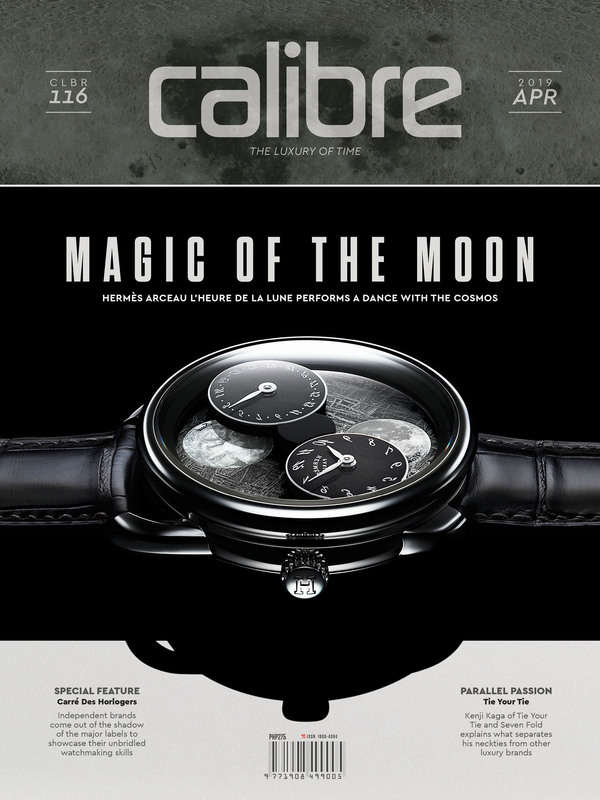 HAVING found its identity in wrist wear that appear to have been filched off airplane cockpits, Bell & Ross — which started its business by cross-branding with Sinn, by the way — is now taking this aviation-theme timekeeping to, well, new heights. Because in its latest offering, called BR 03-92 MA-1, the watchmaker is taking inspiration from a new source even while sticking to a cockpit instrument vibe. As its name declares, the BR 03-92 MA-1 is a model belonging in Bell & Ross’s BR 03 collection — essentially the slimmer 42-millimeter versions of the BR 01 pieces, which are a full four millimeters bigger. Both are the brand’s most identifiable produce; they sport the signature round dial within a square case and large highly legible numerals, markers and hands. Expectedly, then, the BR 03-92 MA-1’s looks can’t be mistaken other than that as Bell & Ross’s. The “MA-1” tag in this new BR 03-92 rendition, meanwhile, points to another military aviation reference. This is none other than the iconic flight jacket of the US Air Force, called the MA-1. 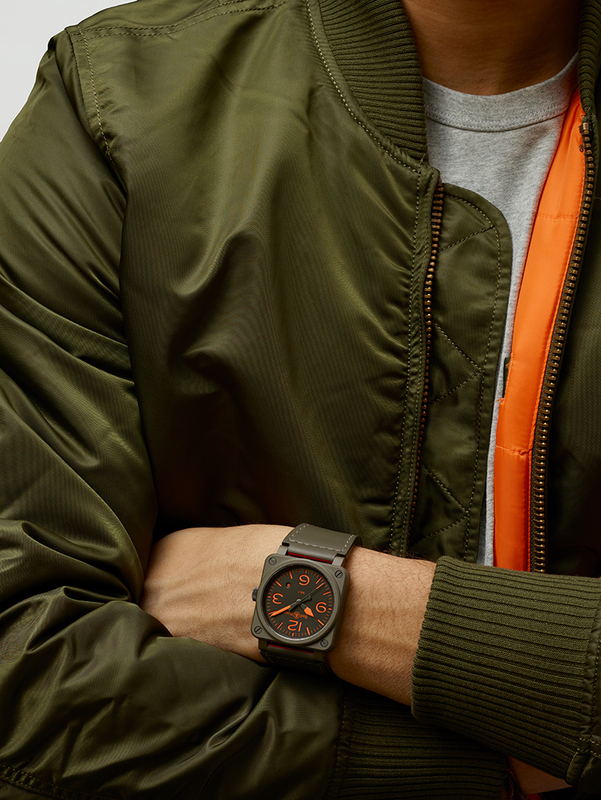 A replacement for the equally legendary B-15 jacket, the MA-1 is a true product of necessity — pilots in the late 1950s were starting to fly jet planes, and so they needed more than the bulky, fleece-lined leather jackets which were meant for propeller-driven aircrafts. As pilots flew sleeker jet planes with tighter cockpits to much higher and colder altitudes, they also required slimmer, warmer jackets. The MA-1’s nylon and polyester construction addressed such concerns. In the years since its introduction, it turned into a fashion statement, too. The BR 03-92 MA-1, limited to 999 pieces, adopts the characteristics that have made its wearable namesake an icon. The watch gets a dark khaki square case made from ceramic, within which is housed a sandwich dial whose stenciled apertures allow the orange luminescent material beneath it to peek through. 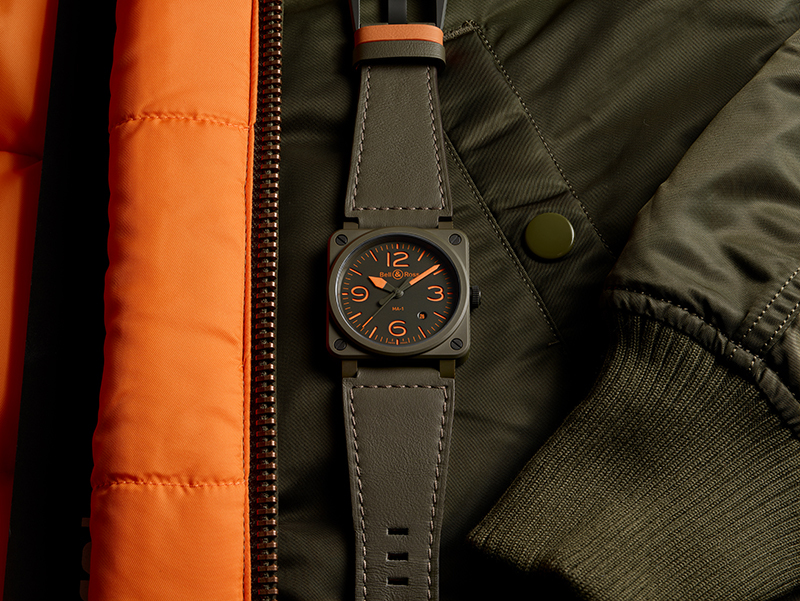 A reversible khaki/orange calfskin leather strap secures the watch to the wrist. Now, why the reversible strap? Bell & Ross explains the bright-orange lining could serve as a wearable beacon for a downed pilot waiting for Search and Rescue personnel. 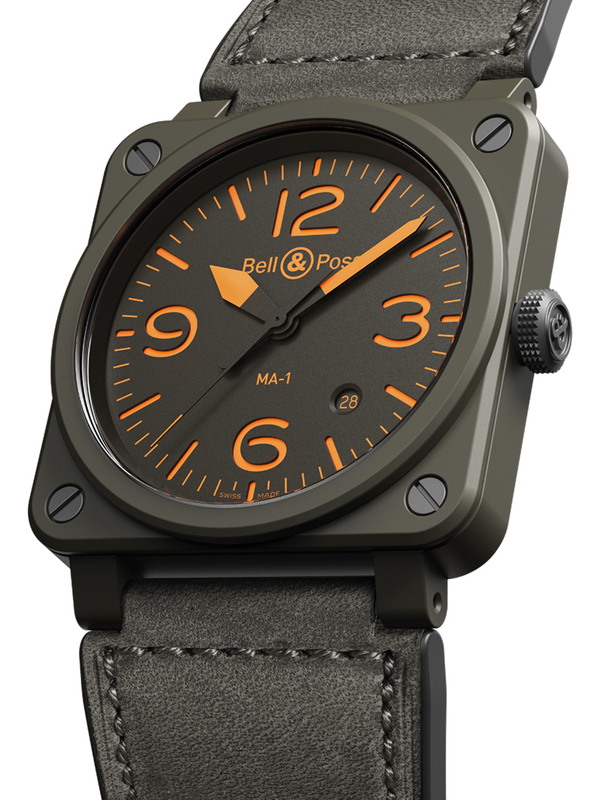 Bell & Ross also says it chose to clad the BR 03-92 MA-1 in ceramic because the material is both scratch-resistant and lightweight — just like the nylon with which the MA-1 jacket is made. The khaki color, also a nod to the jacket, is just as stealthy. Rendering the case in ceramic apparently was not easy; the dark khaki pigment has to be added while the ceramic is still in oxide powder form. Otherwise, the color would not turn up right. 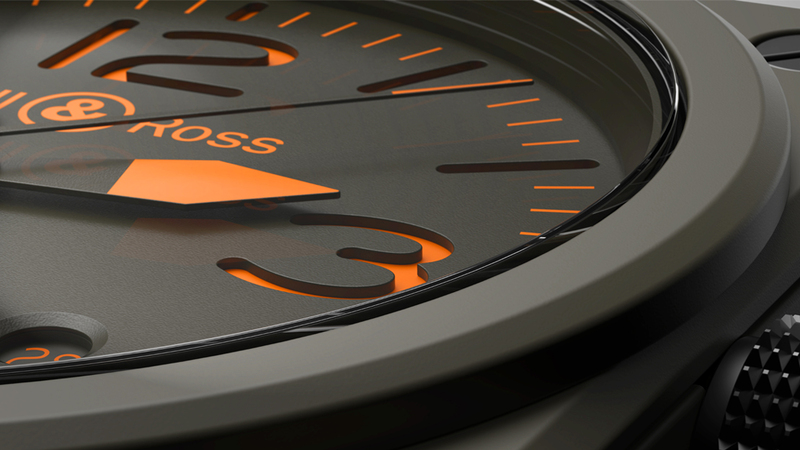 The watch’s stenciled orange numerals, for their part, are intended to afford the wearer legibility even in low-visibility settings — like in nighttime flights. Plus, it cannot be denied the dark khaki/bright orange colorway has always evoked a military flavor. Like most BR 03-92 rendtions, the MA-1 is powered by the self-winding, 25-jewel BR-CAL.302, essentially a tweaked Sellita SW300, which in turn is a twin to the ETA 2892. It oscillates at 28,000vph and can store power good for around 40 hours. This guarantees the BR 03-92 MA-1 is as sturdy and reliable as any cockpit instrument. A new outfit, though, makes the watch way cooler. Whose Masters Record Could Tiger Woods Possibly Match?